The Old and New Testament books that Pastor John Clark, Sr. has completed translating are listed below. These translations have been made from the commonly available Hebrew texts of the Old Testament and the Byzantine text form of the New Testament. As books are completed they will become available here. Also included are draft translations that have not been reviewed, and fragments of some books in the Old Testament that have been translated specially for inclusion in Pastor John’s writings. There may be various comments and notes included in these passages that refer to their use in other writings. PDF documents are also provided for download and printing purposes. We are in the process of translating the Old and New Testament from the available Hebrew and Greek texts. Initially, this work began as an effort to translate the New Testament in order to produce a version free of Christian influences. In time, the translation effort was increased to include the Old Testament. As of August 2018, the New Testament translation has been reviewed and is complete. In the Old Testament, Genesis, Exodus, Judges, Ruth, 1Samuel, Psalms and the minor prophets have been completed, and work is underway in Leviticus, 2Samuel and 1/2Kings. Large sections of Isaiah and Ezekiel and parts of other books have also been translated. Some parts of the the Old Testament translations should be regarded as being “under review”. Translation notes and comments will be found throughout parts of the text, especially in Psalms and Isaiah. In English, the singular and plural forms of “you” are identical. However, in biblical Hebrew and Greek, the differences are obvious. Therefore, to more perfectly convey the biblical writers’ messages in verses where the word “you” appears, I have italicized the “y” of all plural forms, such as you, your, yours, yourselves. Occasionally, we have italicized the first letter of verbs that are plural in the original language, but are not obviously so in English. 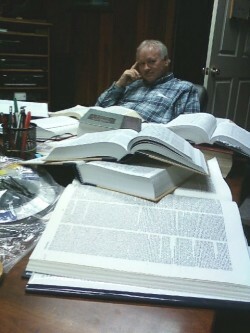 I am writing a reference book about Bible translations. May I ask some questions about your translation? What source are you using for this translation? That is, is it a revision of an existing English translation or from a Greek NT such as Textus Receptus, Nestle Aland, etc? Who are the translators of this work? When was it started? Thank you and may God continue to bless you all. This translation of the New Testament was begun in earnest a couple of years ago. It is being translated directly from the Greek text. It is not a revision of an English version of the Bible. I have come to the conclusion that there is no Greek version of the New Testament that can be trusted completely and alone, but I use principally the Byzantine text, with some reference to the UBS and Nestle-Aland texts, taking into consideration the extreme liberal bent and skeptical attitude of the UBS and Nestle-Aland scholars (I was trained under such men many years ago), as well as the spirit of church religion that seems to have tainted the Byzantine text. I rarely refer to the Textus Receptus because of its limited set of original sources. Our translation committee consists of a group of spirit-led saints. Only the spirit knows the mind of God, and I believe that a group of holy Ghost filled saints is much more likely to come to a godly conclusion in translation matters than experts who do not know the mind of the spirit. We depend more on Jesus than on our knowledge of Greek to know what the text is saying, though we do know that a good knowledge of both is required to do justice to the words and meaning of the original authors. May God help us! The reason that we are making the effort to produce another translation of the NT when there are already so many is the very great need that God's people have of a translation of the NT that is not affected by Christian influences. For one major example, the word "church" is from the Greek noun kuriakon, which is found nowhere in the biblical autographs. The word that Jesus and the apostles used (in the Greek text) is ekklesia, which means simply, "congregation" or "assembly". In Tyndall's translation a few hundred years ago, he refused to mistranslate the word ekklesia and used only the proper English word, "congregation". Churchmen had him executed for daring to translate the New Testament into English. They must have hated him intensely for leaving their word "church" out of his translation. Did you know that King James commanded his translators to mistranslate ekklesia as "church"? He did so in order to hold on to the Church's tenuous political support. We think he sinned by giving his translators that commandment, and we believe that the Church (the religious system called "Christianity") is an institution that has no basis on which to base its claim to be the body of Christ. We pray that Jesus will help us overcome whatever opposing forces exist, and that he will grant us the wisdom and grace to produce for His people a faithful translation of his holy Scriptures, if not a perfect one. Thank you for asking about this translation of the Bible that we are working on. I hope that I have answered your questions satisfactorily. We hope you are blessed by this translation.